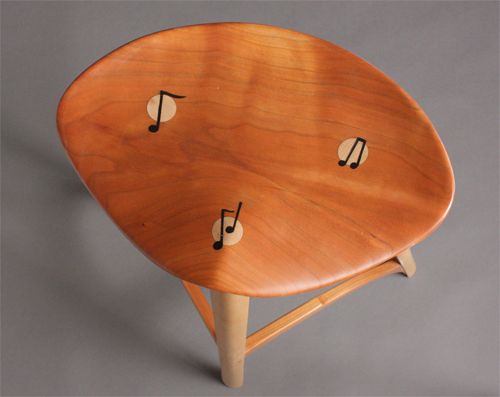 This beautiful and functional music stand was designed and built over a two year period with input from a wide range of musicians, incorporating all of their identified needs. The result is a symphony of form and function. The lines and details are evocative of the experience of music itself. 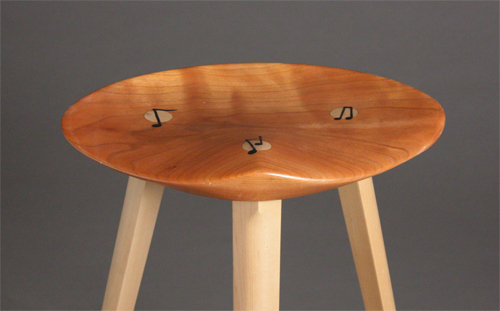 The stand is handcrafted of cherry and curly maple, with a head that interprets a musical staff and communicates a musical flow. 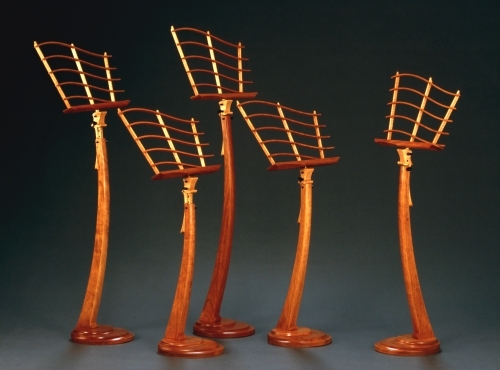 Matched bent-laminated cherry members on the head define the “lines” on the stylized staff while curly maple uprights define the “spaces”. The head pivots on a brass plate and screw system, which allows the user a one-handed tilt adjustment within a 45° range. 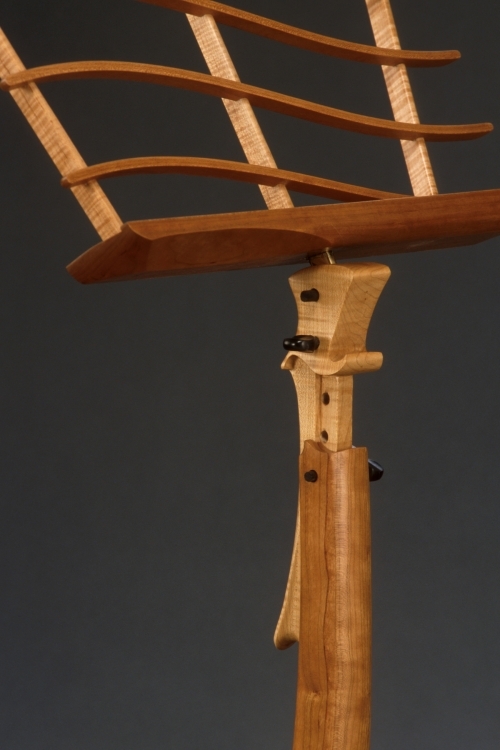 The head and neck are suggestive of a stringed instrument, a lip in the base creates a resting place for the baton or pencil, and ebony violin pegs are utilized to control the neck and height adjustments. 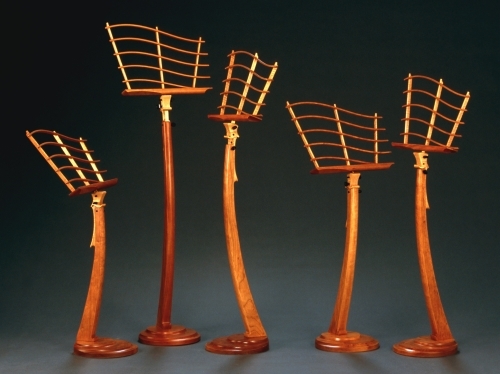 The Lyric Music Stand is rendered in five heights (30”, 34”, 38”, 42” and 46”, measured from the bottom of the sheet of music) and each height offers the opportunity to raise the head, in 1” increments, across a 6” range of adjustment. The stand’s compact 12” diameter footprint affords excellent stability without consuming valuable floor space. 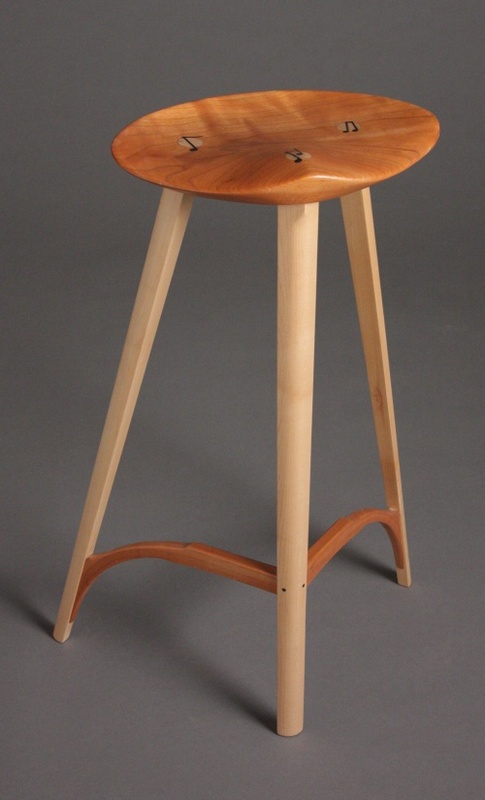 Fashioned on the original Architect’s Stool, this version of the stool has a slightly larger seat and expanded footprint. The legs are through tenons for strength. Note the change from ebony wedges in the tenons to ebony musical notes.